The Malad Range iis a Great Basin limestone uplift that straddles the Utah-Idaho border. It is tucked into the western slopes of the Bannock Range just east of 1-15. The southern end of the range extends into Utah, where it reaches over 8,000 feet in elevation. Boundaries of the range include Malad Valley on the west, ID Hwy 36 thru Weston Canyon on the north, Cache Valley ID-UT on the east, and Bear River at Gates of the Bear on the south. The western escarpment of the range is well cliffed. The Malad Range highpoint is Gunsight Peak 8244 in Utah which is a popular ascent with local youth church groups. 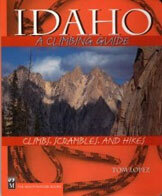 The Idaho side of the Malad Range has 14 ranked peaks. None are frequently visited. 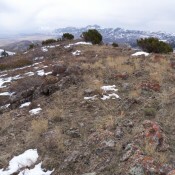 Note: unranked Sheep Dip Mtn on the ID-UT line is actually 10′ higher than the Idaho high point. 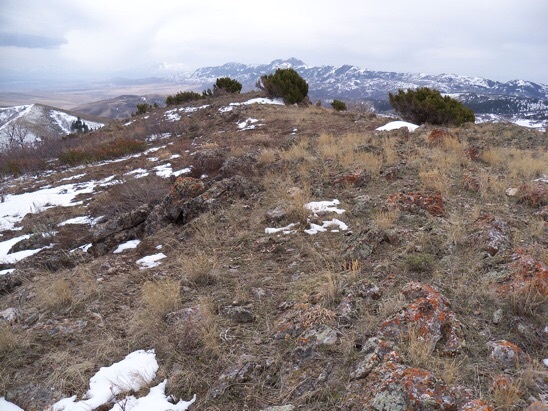 The highest Idaho point is an unnamed Peak 7,047-foot summit. The Malad range is geologically similar to the Bannock Range and is also administered by the Caribou National Forest. This range is accessed from either Malad, via the old highway which parallels the freeway, or from FS-038, which begins at I-15 just north of Malad and follows Deep Creek and then Weston Creek along the eastern side of this subrange. From either of these roads, numerous roads lead into the mountains..